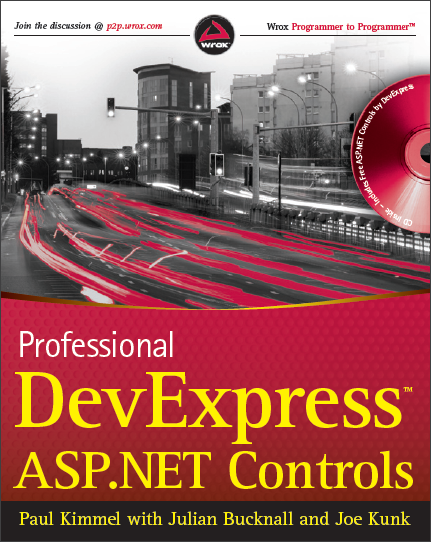 Over the summer I spent quite a bit of time on top of my normal work activities (at least those I couldn't put aside) writing a couple of chapters for Professional DevExpress ASP.NET Controls. Yes, I've been saying for a while that I'd never write a book again, but this was an opportunity to quickly write something that would appear in a book form, without my name being on the cover. Unfortunately Wrox didn't listen to me and put it there anyway :). I been waiting for a DevX book for years - thanks for helping to make it come true! At the risk of stirring your anger (given your great love of writing), when do you expect a book on Win Forms and WPF? Next, a book covering XAF ;) ? Russ: Me personally write a book about WinForms or WPF or both? Using DevExpress products? Possibly never. As I said, I was only brought in at the last moment for this one. Paul is much better placed to do this kind of writing, so we (and Wrox, for that matter) will just have to see how well this one sells before we decide whether or not to do another. Chris: Yes, Wrox suddenly decided that their book range needed jazzing up from the "author head" look (not one that I've found particularly enticing, I must admit) they've had for the past few years. So all new Wrox books will have this updated kind of look, still dominantly red, but obviously with different monochrome images.